When it’s this hot, easy and refreshing are my two qualifications when it comes to preparing dinner. This recipe qualifies on both counts. 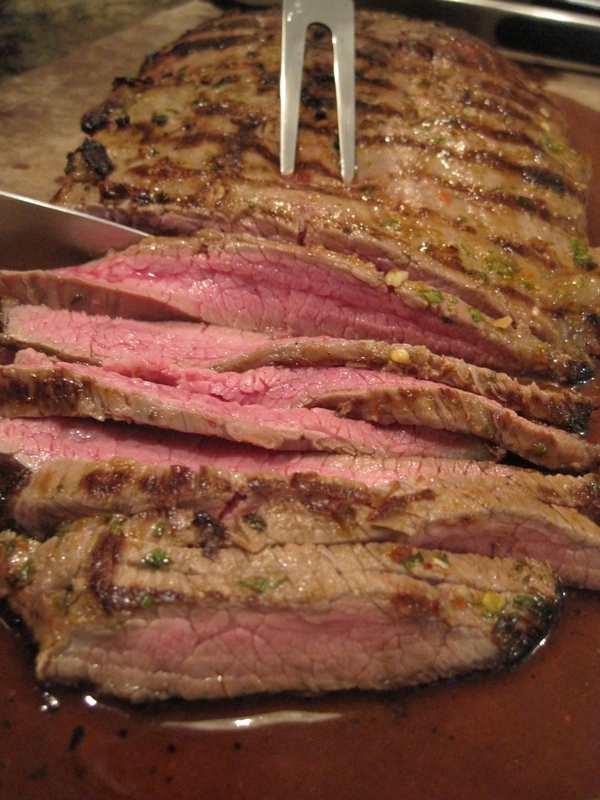 It also uses one of my favorite cuts of meat: the flank steak. Lean and flavorful flank steak is an economical alternative to the prime cuts yet still a step up from the humble skirt steak. Yes, some might say that flank steak has a reputation for being tough, but I promise that cooking it to medium-rare and slicing it against the grain will eliminate any gnashing of the teeth around your dinner table. The marinade for this steak gives a nod to Asia and features hot chili sauce for a little kick and nam pla (or fish sauce) for depth among other things. I marinated the steak for about 3 hours, before I quickly grilled it off on a grill that was way too hot for a sweltering August evening. Realizing that the steak would pack plenty of flavor, I opted for a simple salsa of watermelon, sliced green onions, and lime juice. I made the salsa in advance as I knew that manning a grill in this heat would quickly zap my enthusiasm for this project. 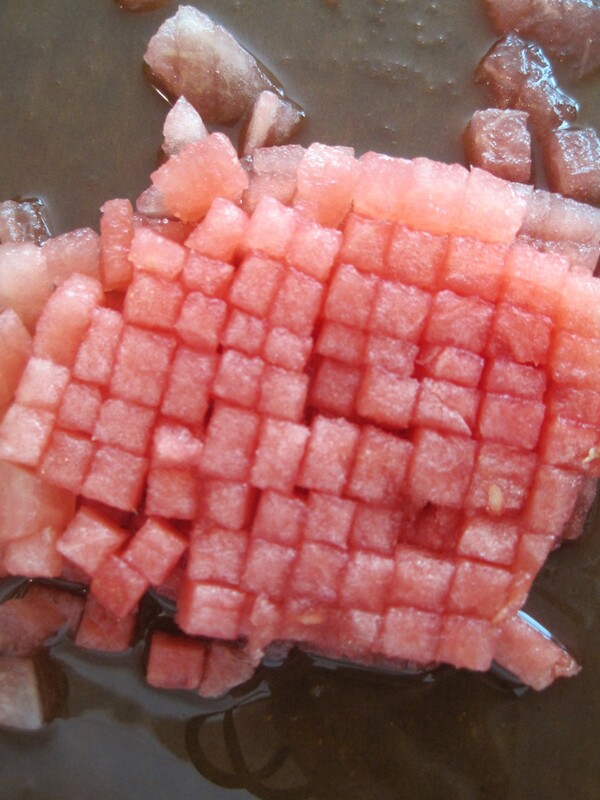 When making the salsa, please cut the watermelon into very small cubes (about 1/4-inch in size). 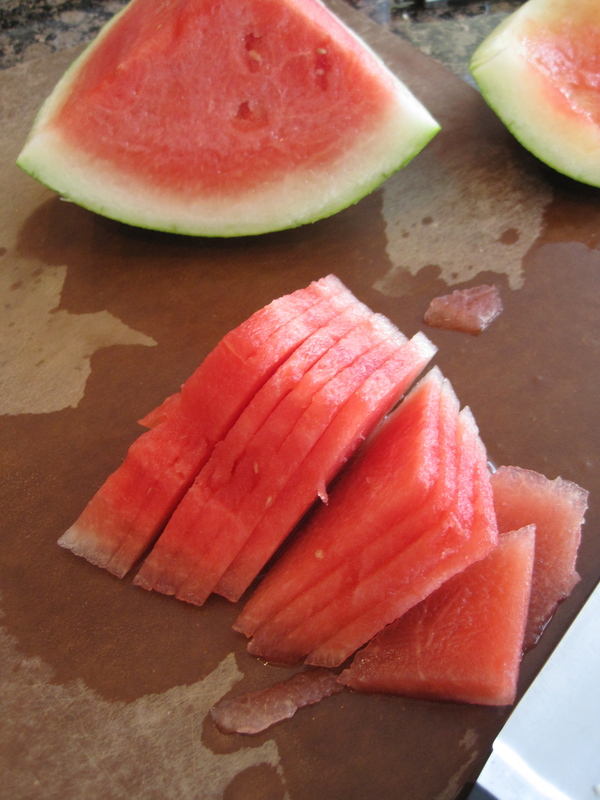 I realize some of you might consider this a painstaking request, but I think that the small dice is important for more than aesthetic reasons as it prevents the watermelon from taking over the dish. While I thought about adding a jalapeño to the salsa, I opted against it this time as I thought that the marinade would pack enough spice. When I make this again, I will certainly throw a minced jalapeño in there, but then again my husband and I tend to be masochists when it comes to spice. Serve the steak hot or at room temperature. 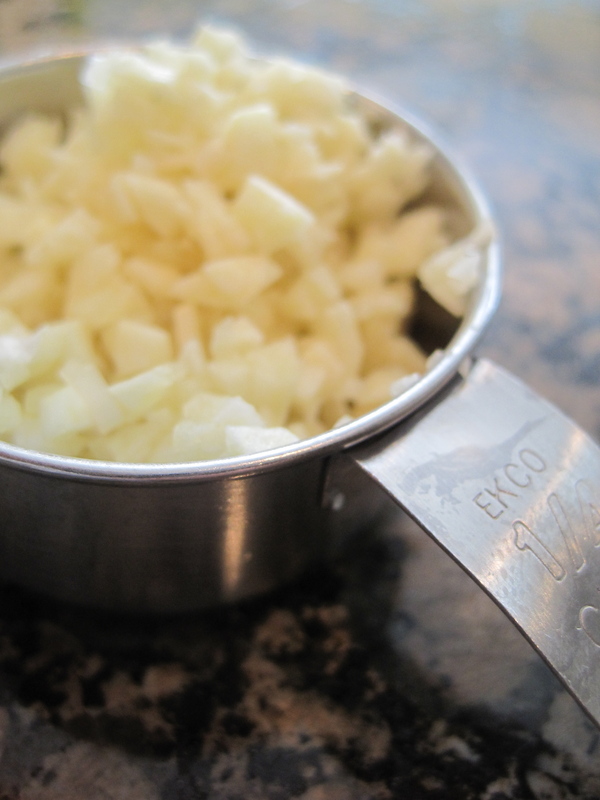 Regardless of how you serve it, let it rest for at least ten minutes before slicing it. Patience is a virtue here and for every minute of self-control, the more juicy your steak will be. Bon appetit! 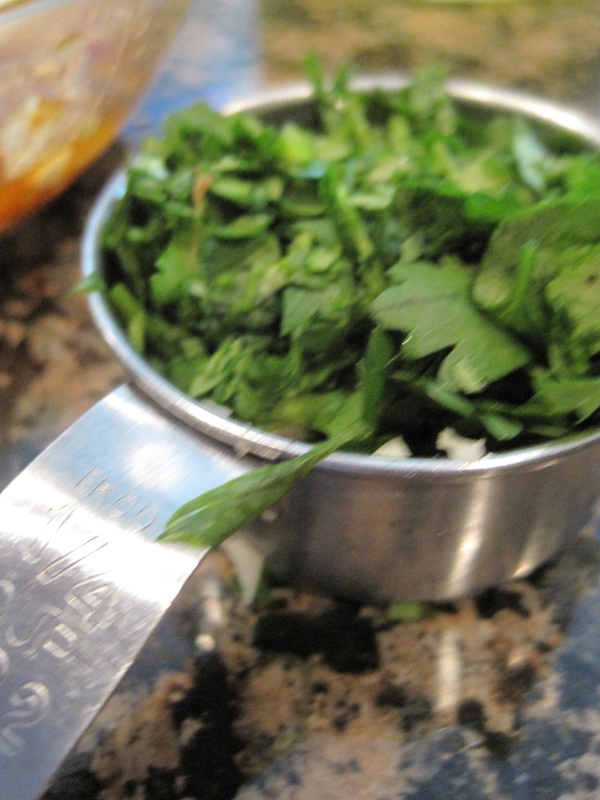 In a small bowl, whisk together the minced garlic, lime juice, lime zest, fish sauce, Asian chili sauce, canola oil, and minced cilantro. 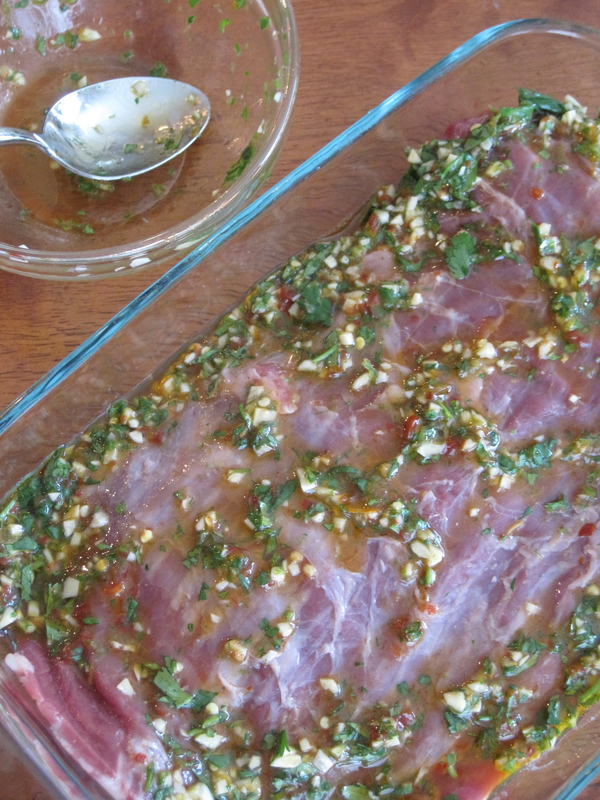 Rub the marinade over the flank steak and let marinate for at least 30 minutes or as long as overnight. 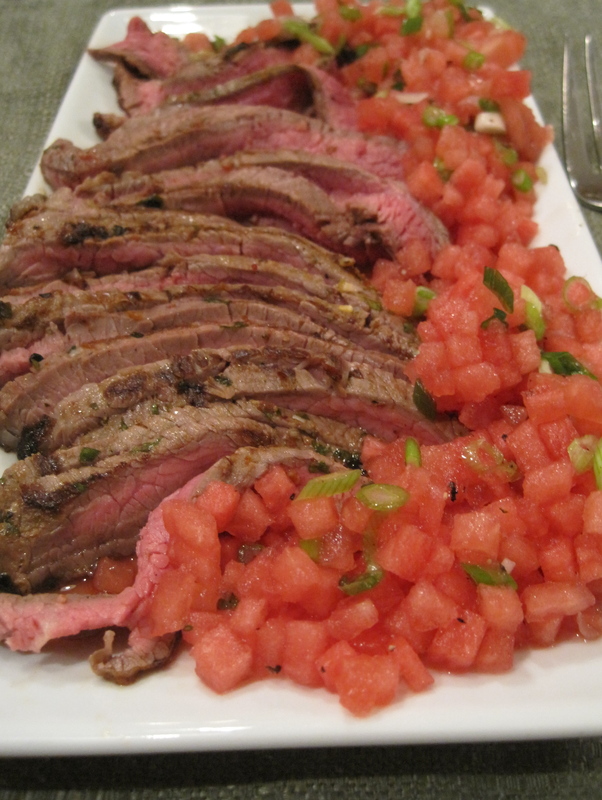 While the steak is marinating, combine the watermelon, green onion, lime juice, and jalapeño if using. Chill until ready to serve. Preheat a grill or grill pan over medium-high heat until hot. Add the flank steak and cook for about 6 minutes on each side for medium rare or longer for your preferred doneness. Remove the steak from the grill and let rest covered with aluminum foil for at least 10 minutes. Thinly slice the steak against the grain. 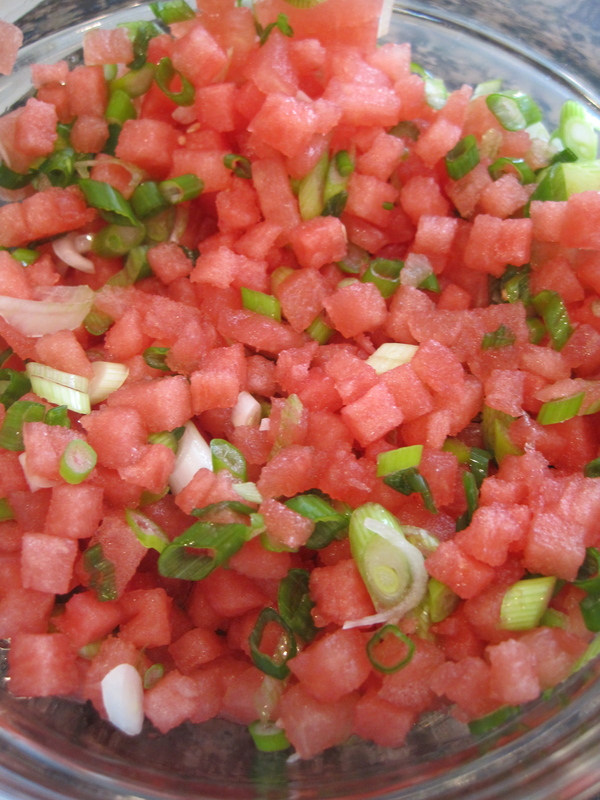 Season the watermelon salsa to taste with salt and pepper. Top the steak with the salsa and serve immediately. While in college my mother discovered flank steak with an Asian marinade she made. It became our Sunday lunch favorite. But we never had a topping like your watermelon special. We actually never had a topping at all! Yours looks wonderful. Each mouthful will bring back memories and start some new ones as well.